Posh defender Ricardo Santos (pink) is available after serving a suspension. Photo: Joe Dent/theposh.com. Manager Graham Westley insists Peterborough United will play their way out of potential trouble for the rest of this season. Westley is adamant his team will stick to the entertaining, attacking philosophy expected by chairman Darragh MacAnthony as they try and arrest their slide down the League One table. On-loan midfielder Martin Samuelsen (right) is fit and available for Posh at Doncaster. Photo: Joe Dent/theposh.com. Posh head to out-of-form Doncaster tomorrow (March 19) to play a team in even worse form. 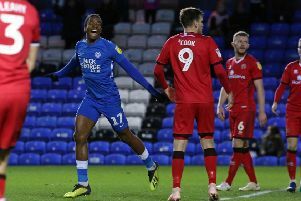 Posh have picked up one point from their last seven League One matches, while Darren Ferguson’s team have collected just one point from their last nine matches. A defeat for Posh could leave them just five points outsisde the bottom four which would surely set the relegation alarm bells ringing. But Westley says his side will go all out for victory tomorrow. There will be no attempt to grind out a result. “While Darragh MacAnthony remains in charge of this football club, there will be no change to the preferred style of play,” Westley stated. “The cahirman is passionate about attacking, entertaining football. He is passionate about scoring more goals than every team in the country. “It’s a philosophy that can work as it’s helped win two promotions from League One to the Championship. “It’s been a challenge for me as I’ve had to try and solve problems in a different way, but it’s great fun to be part of the process. “We’ve shown this season that we can be successful playing attacking football and we aim to get back to that. “Of course we also need to be resolute and determined, but the emphasis ahead of every game is to win, and to win well. “We beat Doncaster 4-0 at our place earlier in the season and you can always take confidence from past results, but we know we will be facing a team who will equally determined to get a positive result to end a run of poor results. The best team on the day wins any game, but you under-estimate any opposition at your peril. “We will have fantastic backing up there and we owe our fans a good performance. Our last awayday in Wigan was a good one and if we can build on that we will have a great chance of securing another excellent result, We want to show our fans the real Peterborough United again. Westley admits his habit of tinkering with the Posh starting line-up has been excessive. He has made at least four changes before a game for the last six matches, but stability will now be the watchword for the final 10 games. Goalkeeper Ben Alnwick is set to return after missing four matches because of injury and defender Ricardo Santos is available again after suspension. Santos was outstanding as a right-back in Tuesday’s (March 15) reserve team win at Leeds United, according to Westley. Mark Tyler is likely to be reserve goalkeeper at the Keepmoat Stadium. On-loan midfielder Martin Samuelsen will be back in the squad after recovering from injury and playing 115 minutes for West Ham Under 21s in a cup semi-final win over Liverpool this week (March 16). “It’s important to be honest and anyone who criticises me for a lack of stability on selection is issuing fair criticism,” Westley added. “There are always mitigating circumstancess like injuries, suspensions or losses of form, but I haven’t been consistent enough. “We’re losing games because we have been getting things wrong, Not so long ago we couldn’t stop winning. “We’ve all learned lessons me included, I’ve tried to see what new players could do in certain situations and in certain positions, but that sort of things belongs in pre-season, not in the middle of a season. “We need to settle things down. We need some stability and I will certainly become more consistent in my selections for the rest of the season. “In my good days at Stevenage we won two promotions and I could name the starting line-ups now as it very rarely changed. “It will be good to have Ben and Mark back though as we need some experience in the side. Rico was outstanding at right-back for the reserves at Leeds and I’m pleased to have such a great player available again. Any side would miss a player of Rico’s ability and he was excellent at right-back against Leeds.